Butts, Edward. "Douglas Jung". The Canadian Encyclopedia, 11 February 2019, Historica Canada. https://www.thecanadianencyclopedia.ca/en/article/douglas-jung. Accessed 19 April 2019. Douglas Jung was the youngest of three sons. His father, Jung Yik Ching, had immigrated to Canada from Guangdong, China. His first name, Douglas, comes from Douglas Street in Victoria, where Jung was born. At the time of his birth, Jung did not have legal status in Canada (see Citizenship). Jung attended Victoria High School, but grew up in a discriminatory environment in which Chinese Canadians	were required to register for an identity card and were denied the right to vote and to practise medicine or law, among other restrictions. In 1944, Douglas Jung enlisted in the Canadian army. He was among a group of 13 Chinese Canadians who volunteered for Operation Oblivion, a British Special Operations Executive (SOE) plan to send agents of Chinese background into Japanese-occupied China as spies and saboteurs (see Intelligence and Espionage), and to arm and train Chinese soldiers (see C hinese Canadians of Force 136). Jung trained at a secret location on Okanagan Lake, British Columbia, and in Australia. He was injured during a parachute exercise during training and remained in Australia as an intelligence instructor. In the end, Operation Oblivion was cancelled when Allied High Command decided that the Pacific theatre north of New Guinea would be led by American forces. Five Chinese Canadians were deployed behind enemy lines in Borneo and later received the Military Medal for their bravery there. The wartime service of Jung and other Chinese Canadian soldiers helped to overcome biased views held by mainstream Canadian society. In 1947, the British Columbia provincial government	withdrew voting restrictions that had been imposed on Chinese Canadians (see Right to Vote in Canada). First of the Force 136 recruits, also known as the Operation Oblivion group, in Darwin, Australia. Back row (left to right): Douglas Jung, Jim Shiu, Norm Wong, Hank Wong, Louey King. Front row: John Ko Bong, Ed Chow, Roy Chan, Wing Won (in front), Norm Low, Roger Cheng, Tom Lock, Vincent Leung, Ray Lowe. Douglas Jung returned to BC after the Second World War. In 1953, Jung graduated from the University of British Columbia	with two degrees: Bachelor of Arts and Bachelor of Laws. He was called to the BC Bar in 1954 and established a law practice in Vancouver. In 1955, Jung became the first Chinese Canadian lawyer to appear before the BC Court of Appeal (see Court System of Canada). In 1956, after a decade in legal practice, Jung became the first Chinese Canadian to run for a seat in any Canadian legislature. He was the Progressive Conservative candidate in a provincial by-election in the riding of Vancouver-Centre. He lost to Social Credit candidate Leslie Peterson, but Jung’s strong showing was considered a moral victory. 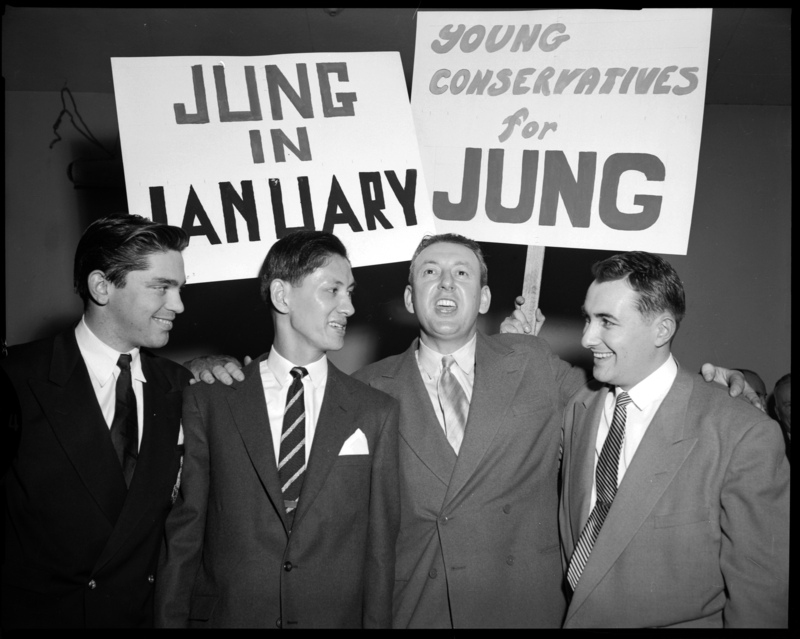 In the federal election 1957, Jung won an upset victory over heavily favoured Liberal incumbent, defence minister Ralph Campney, in Vancouver-Centre. He was nicknamed “The Giant Killer” for defeating a sitting Cabinet minister. Jung was the first Chinese Canadian to become a Member of Parliament (MP), he served in Prime Minister John Diefenbaker’s minority Progressive Conservative government ( see Minority Government). In his first speech before the House of Commons, he addressed the importance of Canadian leadership in relations with Pacific Rim countries. He won re-election in Diefenbaker’s 1958 landslide victory that gave his party a majority government. That year, Jung was elected national president of the party’s youth wing. 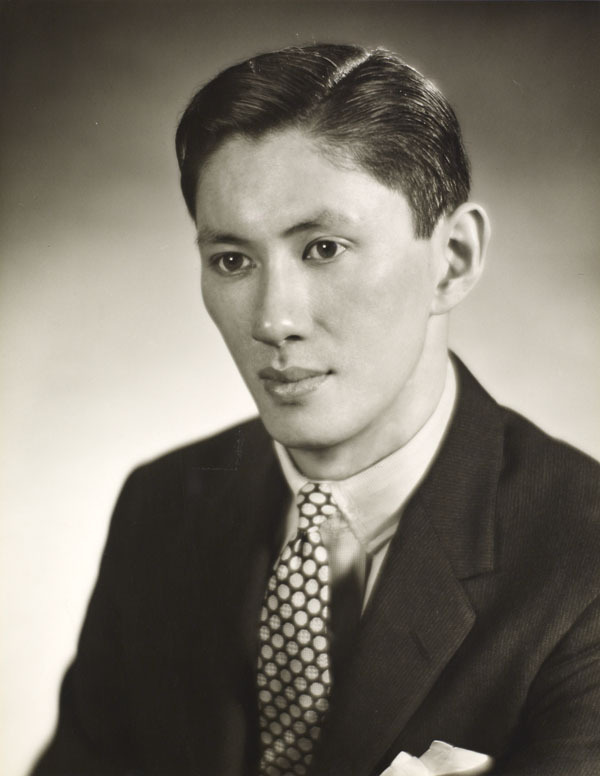 Douglas Jung was a dedicated and innovative MP who worked for Canada’s national interests and consistently served both the Chinese and non-Chinese communities. He fought for changes in regulations that would be financially beneficial to old age pensioners and students. He supported the establishment of the National Productivity Council (now the Economic Council of Canada), was Chairman of Canada’s Legal Delegation to the United Nations, and led the Canadian delegation to the Model NATO Youth Summit (see NATO). Jung called on the Canadian government to apply equal standards for Chinese and European immigrants, resulting in the admittance of one hundred Chinese refugee families into Canada and financial aid for Hong Kong refugees. Jung sympathized with Chinese immigrants who had been living in Canada without legal status due to discriminatory immigration laws (see Chinese Head Tax	and Chinese Immigration Act). He supported an amnesty that would allow undocumented Chinese immigrants to obtain citizenship	and would end the trade in fraudulent immigration documents. However, his insistence that the amnesty period should be limited was unpopular in the Chinese community. Jung sparked controversy when he spoke publicly about personally visiting Communist China. Diefenbaker stated that his government did not endorse such a visit, and many of Jung’s Chinese Canadian supporters were critical of the idea. Jung was defeated in the 1962 election and in the two federal elections following. After his career in politics, he returned to his law practice.